Of the mainstream brand no one really fudges with pu-erh. It’s rare and takes a while to process and make so I commend Numi for taking on the pu-erh challenge (81st annual). Numi has 8 pu-erhs in their lineup. I’m a fan. 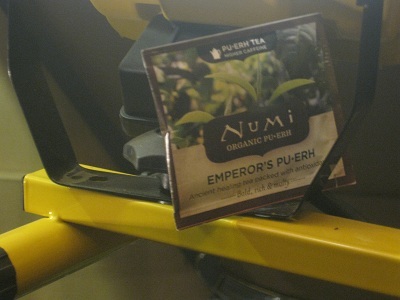 Numi Emperor’s Pu-Erh is a solid steep with plenty of that soil-taste you have come to know and love. Maybe even a little too much. It’s fall right now in Chicago but I can’t help but be reminded as a kid playing in the fall rain. It’s dark and it’s only 6:00. The leaves are wet from the rain and the dew and there’s a particular smell to them. It’s Pu-erh! Pu-erh is not for everyone. It’s for me, but I can see amateur teasans with simple tastes hating on pu-erh for its earthy-by-nature nature. This particular one, Numi Emperor’s pu-erh is a nice fingerroll but not a 180 dunk.